1Nanomaterials Research Laboratory, Department of Applied Sciences, Chitkara University, Rajpura, Patiala – 140401, Punjab, INDIA. 2Chitkara College of Hotel Management and Catering, Chitkara University, Rajpura, Patiala –140401, Punjab, INDIA. 3Department of Pharmacognosy and Natural Products, Chitkara College of Pharmacy, Chitkara University, Rajpura, Patiala – 140401, Punjab, INDIA. Aim: The objective of the present study was to develop a novel energy bar which is nutritious and cost effective. Materials and Methods: The components used for the novel energy bar were banana, orange, peanuts, raisins, cocoa butter, stevia leaves and oats. Mineral contents of energy bar were analysed by XRF technique. Results: The mineral contents were present in comparable amount. Major elements viz. K 17.15%, P 4.57%, Mg 1.43%, Ca 0.93%, Na 0.66%, S 0.54%, Fe 0.15%, Zn 0.05% and Cu 0.02% were present in energy bar. Conclusion: Minerals are good for overall growth of body. The energy bar also contains no preservatives, binding agents and sugar free. So, the energy bar is major source of energy and minerals for all age group individuals. Chitkara M, Kohli R, Sandhu IS, Singh D, Kaur G, Sindhu RK. 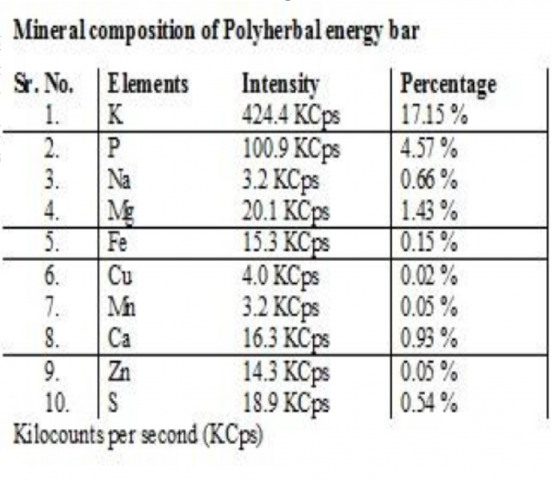 Mineral Content Analysis of Polyherbal Energy Bar Using X-Ray Fluorescence Technique. Pharmacognosy Journal. 2019;11(1):53-56.